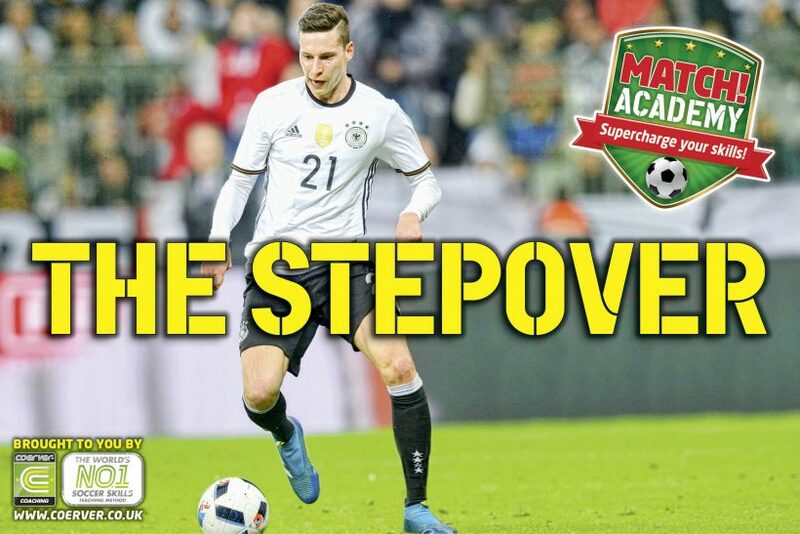 The Stepover is an awesome skill – it helps create space to the left or right of an opponent that’s in front or behind you in a 1 v 1 situation. Tricky Germany winger Julian Draxler uses it all the time! DO IT WHEN IN ATTACKING AREAS! This epic feint move is great to do when you’re heading towards goal looking to shoot, run or play a killer pass. Draxler’s the master – he was Wolfsburg’s top scorer and leading assister in the Champions League this season! Learn it below! While moving forward, tap the ball to your right twice with the outside of your right foot. Now bring the inside of your left foot around the outside of the ball – this is the Stepover action. Then repeat these actions but with your other feet. Start slowly and gradually add more speed to the movement! Run forward with the ball and try to keep your Stepover foot low. Bring the inside of your Stepover foot around the outside of the ball and step as wide as you can. Now touch the ball away with the outside of the same foot and accelerate away! Run forward with the ball and use the sole of your foot to ‘slap’ the ball across your body. As the ball moves across you, keep your opposite foot low and step around the ball. Now, touch the ball away with the outside of the same foot and put the burners on!